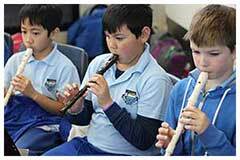 At Mawson we offer the Instrumental Music Program (IMP) to students in Year 5 and 6. 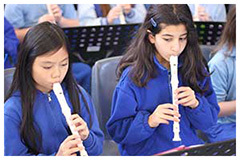 Students have the opportunity to play a range of woodwind instruments and learn to read music. They participate in three sessions each week (two of these involving expert tuition from an IMP music teacher) and once a term combine with other schools for large group performances. An important component of this program is regular home practise which is recorded in a student music journal. The program culminates at the end of Year 6 with a performance called Bandstravaganza; a concert performance by all ACT school bands. 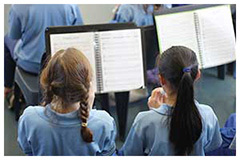 Instrumental Music classes have a maximum of 25 students. They are selected in Year 5 based on input from classroom teachers on class behaviour, attitude to learning and their performance in a basic music exam. There is a cost to families for their child’s participation. This pays for rental of the instrument, expert tuition and the cost of consumables. Financial support is available through the school’s Student Support Fund at the discretion of the Principal. Further information about this program can be found at http://imp.act.edu.au/home .